"No. There is work to be done," Pentagon Press Secretary Dana White told the Washington Free Beacon when asked if Mattis plans to leave office at the halfway point in President Trump's first term. She did not elaborate. The modernization includes a focus on high-technology weapons systems driven by artificial intelligence and autonomous systems, such as drones. He is also managing policies and strategies related to the deployment of U.S. military forces battling terrorists around the world and directing the upgrading of American nuclear forces. A combat veteran of the wars in Iraq and Afghanistan, Mattis is one of Trump's most widely respected cabinet officials. A former commander of the Central Command with wide experience in the Middle East, Mattis has extensive knowledge of military affairs and as defense secretary has rapidly shown new skills in the often difficult area of policy-making and politics that come with heading the Pentagon. Trump was asked about staff and cabinet changes at a press conference Wednesday and noted that it is common for officials to depart administrations after two years. But he said he is was satisfied with his current group of top aides. Hours after the comments, Attorney General Jeff Sessions announced he was retiring at Trump's request. Sessions had come under fire from Trump for recusing himself from the Justice Department probe into Russian collusion during the 2016 election. The recusal left Deputy Attorney General Rod Rosenstein in charge of the Russia probe. Rosenstein called for creation of the ongoing special counsel investigation led by former FBI Director Robert Mueller after Trump fired FBI Director James Comey last year. "I'll tell you, there will be changes. Nothing monumental from that standpoint," Trump said. "I think what I'll do is as we make changes, we'll sit down and talk to you about it," he said. "I mean, there's no great secret, a lot of administrations make changes after midterms." But then he added: "I will say that, for the most part, I'm very, very happy with this cabinet. We're doing a great job." Asked if White House Chief of Staff John Kelly, like Mattis a retired Marine Corps general, will be leaving, Trump said, "People leave. I haven't heard about John Kelly." "But, no, people leave. They come in, they're here, it's a very exhausting job—although I love doing it, I must tell you—but it's exhausting for a lot of people," he said. "I'm surprised at a lot of people. They start off, they're young people, they're there for two years, and they're old by the time they leave." Trump said he has many people lined up for every single position in the White House. "Everybody wants to work in this White House," he said. "We are a hot country. This is a hot White House. We are a White House that people want to work with." Trump also said that he planned to keep Vice President Mike Pence on as his running mate for the 2020 presidential election. Speculation Mattis could leave the administration was fueled by comments from Trump during an interview last month. The president was asked if Mattis planned to step down and said "Well, I don't know. He hasn't told me that." "I have a very good relationship with him. I had lunch with him two days ago. … It could be that he is. I think he's sort of a Democrat, if you want to know the truth. But Gen. Mattis is a good guy. We get along very well. He may leave. I mean, at some point, everybody leaves. Everybody. People leave. That's Washington." The question was prompted in part by a report in the Washington Post by journalist Bob Woodward, author of a book on the Trump administration, who asserted that Mattis has made disparaging comments about Trump. Mattis issued a statement Sept. 4 denying Woodward's reporting, saying such comments were "never uttered by me or in my presence." "While I generally enjoy reading fiction, this is a uniquely Washington brand of literature, and his anonymous sources do not lend credibility," he stated. Mattis noted the policymaking is "inherently messy" and that he embraces debate and the open competition of ideas. "In just over a year, these robust discussions and deliberations have yielded significant results, including the near annihilation of the ISIS caliphate, unprecedented burden sharing by our NATO allies, the repatriation of U.S. service member remains from North Korea, and the improved readiness of our armed forces," Mattis said. "In serving in this administration, the idea that I would show contempt for the elected commander-in-chief, President Trump, or tolerate disrespect to the office of the president from within our Department of Defense, is a product of someone's rich imagination." 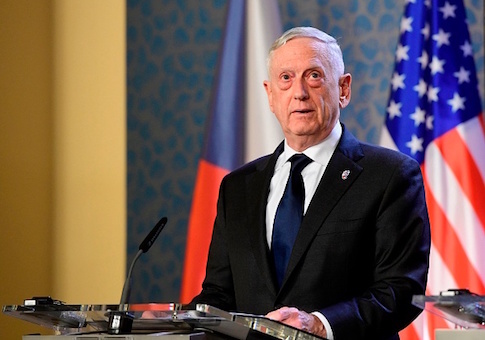 In remarks on defense policies at a think tank Oct. 30, Mattis identified Russia, Islamic terrorism, and China as the three most urgent priorities. Mattis said he is opposed to overuse of the U.S. military as a tool of foreign policy, including against foreign terrorism because "you simply couldn't shoot your way out of this problem." The defense secretary is grappling with the war in Afghanistan where U.S. military forces are trying to train an Afghan military to take over the security of the country in the face of the Islamist Taliban insurgency. In Iraq, Mattis ordered a shift in strategy and tactics to oust Islamic State terrorists and in Syria, the U.S.-backed Syrian Democratic Forces have been doing most of the fighting against the Islamic State. On Russia's violation of the 1987 Intermediate-range Nuclear Forces (INF) Treaty, Mattis said successive administrations have spent 10 years trying unsuccessfully to press Moscow to end its violation—the deployment of the SSC-8 ground-launched cruise missile that violates the accord. "What does it do to us in terms of military terms? I don't want to go into too much detail, but there are options, both symmetric and asymmetric, that are available," Mattis said, adding that Trump would decide what measures to take in response. This entry was posted in National Security and tagged James Mattis, Trump Administration. Bookmark the permalink.